It is well known in the trucking industry that making a left turn across a highway with a long vehicle creates problems that automobile drivers do not have. Any properly trained truck driver and company dispatcher planning a driver’s route should know the widely accepted safety principles in trucking is that a tractor trailer driver should never start turning until there is enough time for the rear of the vehicle to clear the intersection without forcing opposing drivers to slow down or swerve. 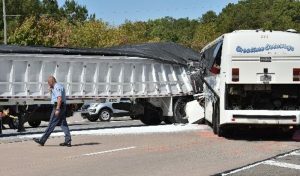 This is supported by a variety of industry safety publications, including each state’s Commercial Driver’s License Manual, the USDOT’s “Commercial Vehicle Preventable Accident Manual, A Guide to Countermeasures,” safety publications of J.J. Keller Company and other driver training manuals. The left turn across traffic hazard is so well known that some national trucking companies have manuals for their drivers that prohibit left turns and U-Turns. These manuals make it clear that these are among the most dangerous maneuvers a tractor trailer driver can perform. The root cause analysis of this crash will likely involve failure of the company to train and manage its drivers and dispatchers to avoid left turns across traffic on highways. Why are left turns in tractor trailers so dangerous? Studies have shown that making such a turn from a stop takes the average truck at least 40 seconds to complete. During that time, the trailer is blocking the travel lanes and presents a hazard to all other traffic. Traffic traveling 60 mph will travel approximately three-fourths of a mile while the truck is completing this maneuver. This crash occurred in daylight in a location with limited sight lines, and a left turn across traffic rather than a U-turn. It is even more dangerous at night because the brightness of the truck’s headlights will mask the marker lights on the trailer. The reflective striping on the side of the trailer is invisible until the trailer is close to be at a 90 degree angle across the road. Combine these phenomena with the fact that a car driver sits low enough to see under the trailer and focus on lights that are farther away and you have created an invisible barrier for approaching traffic. According to news reports, this truck is owned by Polcon Tile & Terrazo out of Charlotte, North Carolina. The company lists five trucks for private delivery rather than as a motor carrier hauling for others. The Federal Motor Carrier Safety Administration (FMCSA) safety records online show that in January 2015, inspectors issued two unsafe driving violations to Polcon drivers. One was a lane restriction violation in South Carolina, and another for failure to obey a traffic control device in Georgia. More information is probably available through a Freedom of Information Act request to the FMCSA. Because Polcon operates tractor trailers for its own deliveries rather than as a motor carrier hauling for others, its liability insurance information is not available online. 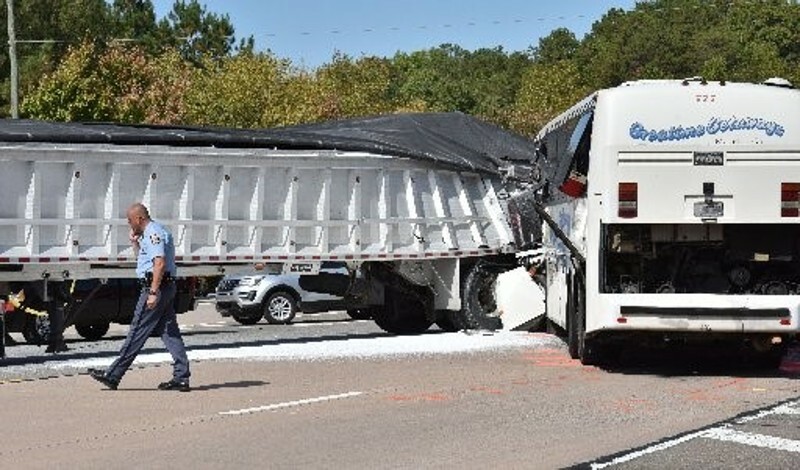 Since first posting about this crash, I have learned that the company has liability insurance in the amount of $7,000,000. Over the past 20 years, we have represented numerous injured occupants of tour buses, college buses and vans, etc. Often we have utilized joint prosecution agreements to coordinate efforts of counsel for victims. Ken Shigley is a past president of the State Bar of Georgia, a board certified trial attorney of the National Board of Trial Advocacy, author of Georgia Law of Torts: Trial Preparation and Practice, and a member of the board of governors of the Academy of Trucking Trial Attorneys. Ken Shigley is a candidate for election to the Georgia Court of Appeals in 2018.